Yakima, WA – Washington State Apple and Pear Harvest is right around the corner. Borton Fruit’s organizing all harvest crews and diligently working to evaluate all of our orchard blocks in hopes of putting the finishing touches on our crop, while yielding the highest quality fruit we can. 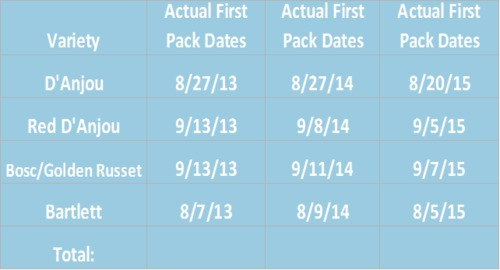 Below, please find our estimated first pack dates for all of our Apple and Pear Varieties. Please note these estimates are subject to change due to weather and other agricultural factors. 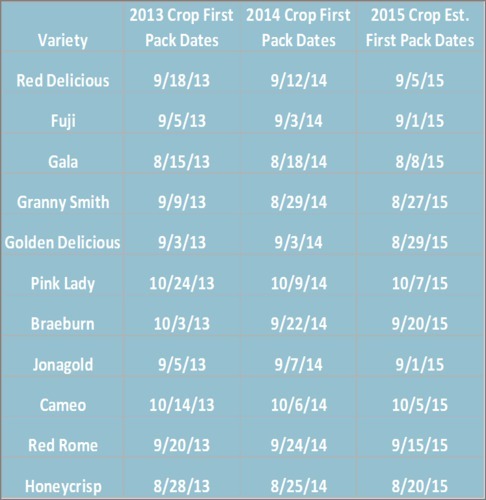 This is a general guideline for when various apple and pear varieties will be available from Borton Fruit. Our goal is to harvest the best quality crop possible in order to meet all of our customer’s needs. We hope this information is helpful for planning your merchandising activities this fall. We are looking forward to a great 2015 Crop season! Please contact your Borton Sales Representative for further inquiries/questions regarding any specific Borton Products as well as our new crop fruit.